This is my replacement head for my 'hot off ebay' £24 Tervigon. 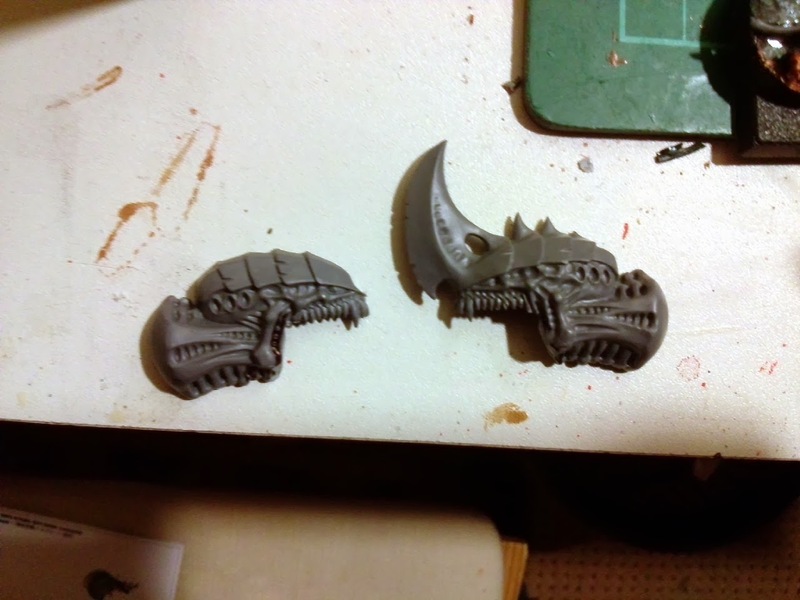 I wanted the Tyrannofex head for something different and then added the spare Mawloc jaw. Some extra effort joining the stretched skin to the upper jaw may have helped but I'm hoping I can disguise it a bit more when it's painted. 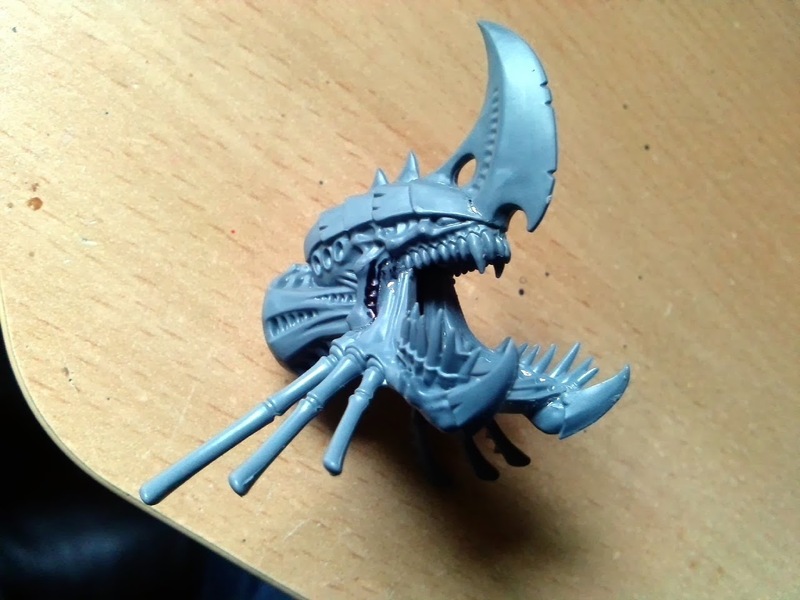 Here's how I cut the T-fex head, should you wish to repeat the process, it's pretty straightforward, the Mawloc jaw fits really easily from these cuts/ The only real issue is in the roof of the mouth and I kept trimming that so eventually the bits slotted together. Still not 100% sure on the bamboo spikes, they look cool but will probably get in the way of it's front arms. 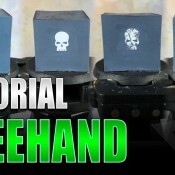 It is looking super cool all round though, glad I did this now. 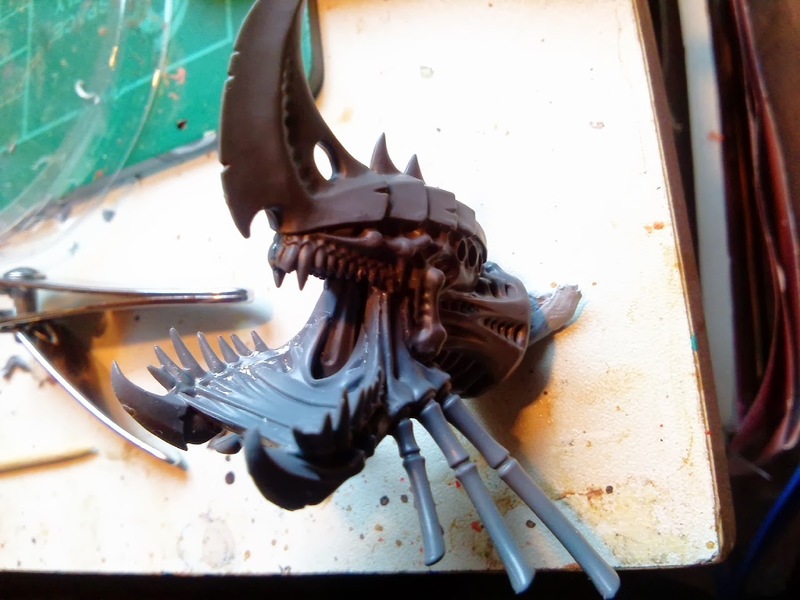 Originally I was sceptical doing it, didn't want to screw up the T-fex head and waste the Mawloc parts but given how easy the kit bash was and how good the final result is I'm definitely glad I've got something quite unique now. 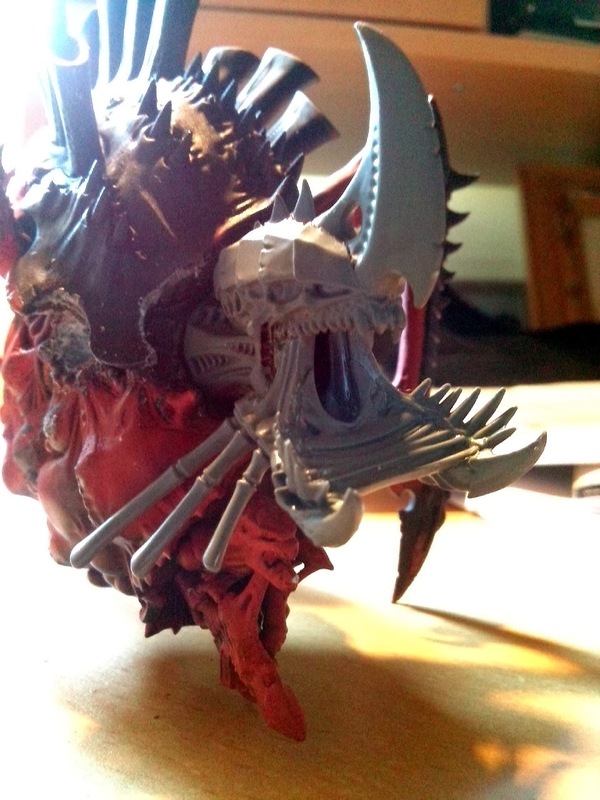 And the front view gives the potential for the Miasma Cannon, so no tongue going here. However you are supposed to remove it's Scything Talons to add the upgrade, but given the Scy Tals offer no benefit anyway I'll still keep them and shoot from the mouth. I've blu-tacked it in place so you can see how it looks.Clearly those Bamboo bits add an nice protective frames to the newly spawned gaunts, I like it I just don't know how the arms will intereact. 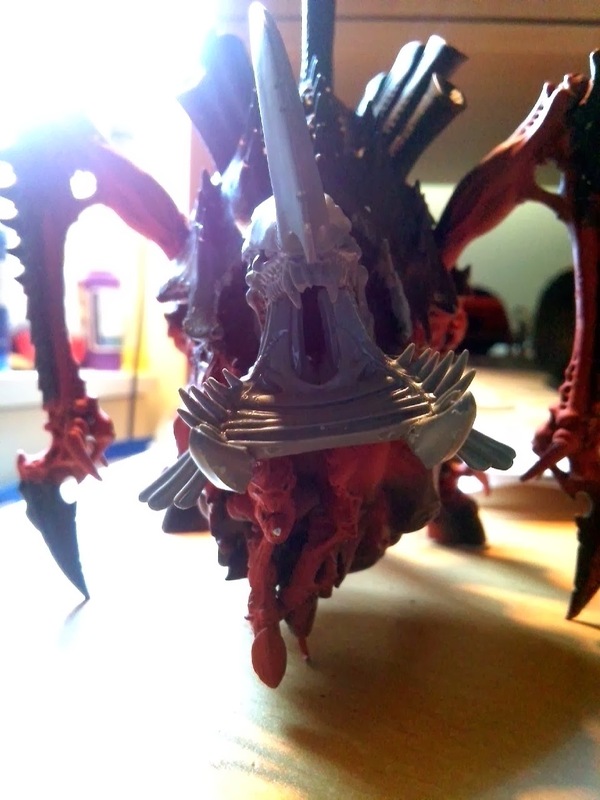 I've since added a piece of sprue on the back of the head so I can paint it with ease, unfortunately the 4" of plastic makes it a bit harder to visualise how it will affect the arms, now that I've also magnetised them. At this stage I hadn't done that so it's a bit of guess work. But I'm not sure you can really argue with that visage. Still to come I have to base the tervigon but need to do so in such a way as I can paint it without being based and then attach to the base afterwards. A tricky job and a bit of a stumbling block. 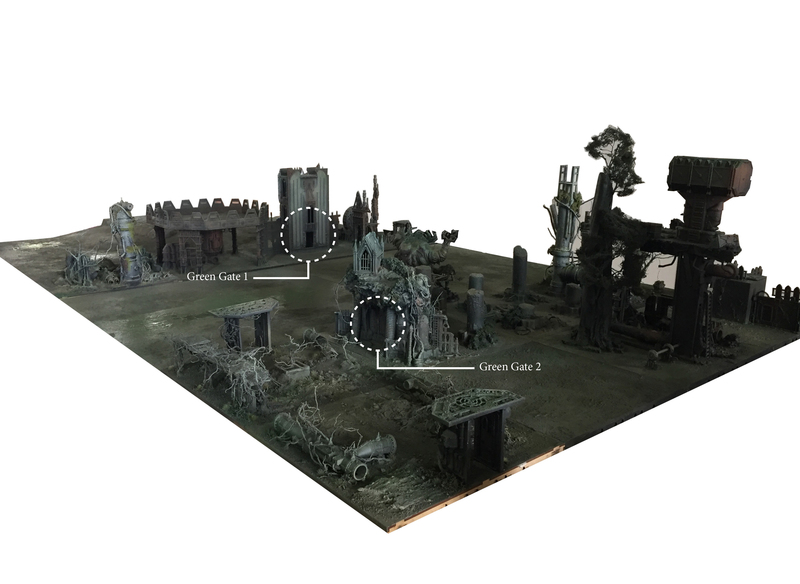 It's questionable if I can finish the 10 remaining Termagants, the Skyshield walls AND the Tervigon by Throne of Skulls. 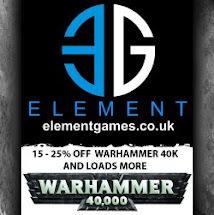 Some may think so as we're talking about 5 weeks but the gaunts should take about a week to two and the walls probably the same which gives me one week on the Tervigon, not enough in my book. But we'll see how things progress. 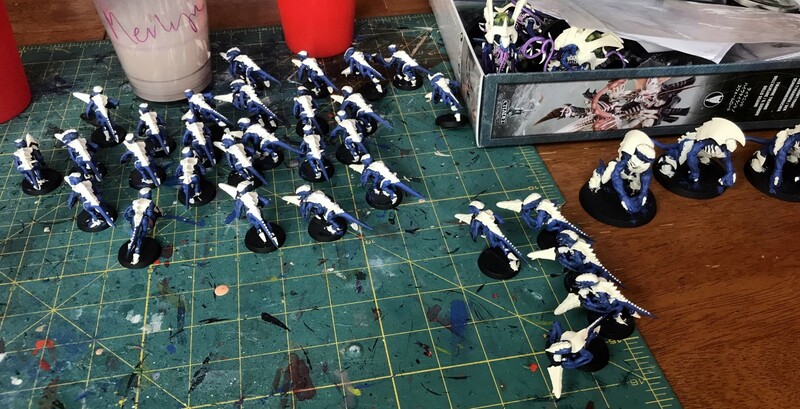 If I can speed the Termagants up and make AND paint the walls in 1 week [the walls should paint in 2-3 nights] then I might have enough time for the Tervigon, it's a race now, so lets see where I finish!